Click the button below to add the (720) P.A.C.K. 720 Molle Custom Load Out (Urban Spec Camo) to your wish list. The new P.A.C.K. 720 in Nuclear Green and Urban Spec Camo are part of a new collectors series. These limited edition bags will only be available once in very limited quantities of just 200 of each color. Every limited P.A.C.K. 720 will feature a unique number of 001 - 200. With your order, you will receive a random number between 1 and 200 making you part of a very small group of gamers. Each Limited Edition P.A.C.K. 720 also features our special 10 year anniversary patch and new Battle Foam logo. Every bag will still have the same durable design as all Battle Foam products and will fit current foam tray sizes. Stand out in your gaming group with one of the rarest storage solutions on the market. *Available through the US warehouse only. The P.A.C.K. (Personal Army Combat Kit) 720 can fit 12.5 inches (318 mm) of Battle Foam Large (BFL) size foam trays (15.5W x 12L"). Its rugged, Ballistic Nylon exterior protects a hard plastic interior built for strength and durability. The P.A.C.K. 720 also has a molle system, which allows you to further customize this bag to fit your specific storage and transportation needs. Molle accessories offer storage solutions for tablets and books, dice and other gaming accessories as well as cell phones and additional personal items. To view and/or purchase these accessories, click here. This bag does meet most airline requirements for carry on luggage. However, please check with your airline to see if it exceeds their size limits to ensure it will meet your needs with regard to air travel. When you are selecting trays to fill your bag, please add a 1/4 inch (6 mm) to every tray's thickness to allow space for the bottoms. We will include foam toppers for any extra space that is left in the bag. Custom text or logos are not available on the toppers. 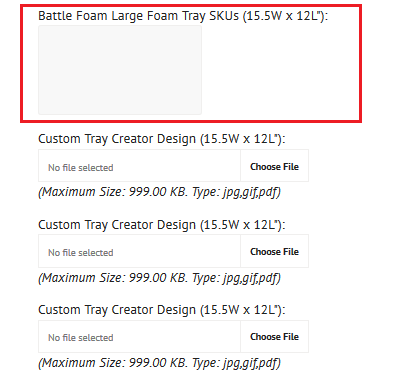 Battle Foam Small Foam Trays are not included in the custom load out, but can be purchased separately. 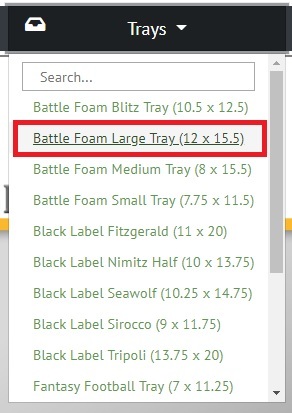 Browse our library of pre-designed Battle Foam Large foam trays before you choose to design your own. These trays are categorized by army for easy searching. Next, you'll need to locate the height of the tray to make sure your selection will fit in the bag. The tray height will be listed under each tray description. Take this number, and add a 1/4". You'll need to follow this step for each tray you are putting into the bag. Example: A 6 inch thick tray will total 6.25" with the bottom added. Type in the tray SKU under the "Standard Tray List" box of the custom load out. 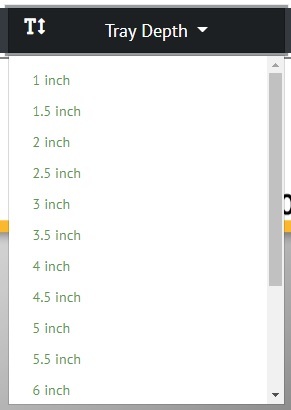 If more than one thickness is offered, please specify. 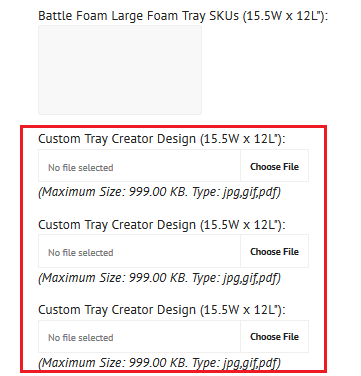 If you choose to design your trays, our Custom Tray Creator is a great tool that allows you to design every inch of foam to fit your army's specific needs. By using the custom tray creator, you ensure your load out will turn out exactly as you want. If at any time you require assistance in how to build your custom trays, please contact us via chat, email, or call us at 877-336-3626. You will want to select the "Battle Foam Large" tray size for this bag. Custom text is available on the trays where available. It is very important that you select your own height for your custom tray. Once your tray design has been completed, save it as a .jpg, and upload to the cart. You may also provide traces that the designers will use to build your load out. All traces require a ruler on the side of the page for scaling purposes (a printable .pdf can be found here). Please keep in mind that this type of order will be left completely up to the discretion of the designer. By using this method, you understand that some variations in the design may occur. Unless the custom tray creator is used to design your trays, overall finish will be solely left up to our staff. Blueprints can be emailed upon request. Please allow 3-4 weeks for design and production of custom foam. A representative will contact you prior to any changes made to your custom load out. Warning: The bag design is intellectual property of Battle Foam® and is protected by Copyright Laws. Unauthorized reproduction of these designs is prohibited by Federal Law and is subject to criminal prosecution.